I’ve been longing for some Spanish tapas ever since visiting Dos de Mayo in Seville last month. We don’t have anything even close in the U.K, never mind in Bolton but we do have a nice, simple and very decent little tapas restaurant ‘La Salsa’. It’s been a few years since my last visit but I was a regular in the past and always enjoyed it and I hear that it’s still doing good things. Something else we don’t have is the Southern Spanish sunshine, it was cold and very wet on the way to La Salsa, a far cry from the 48° of Seville. Still, we’d better get used to it, we’ve had our 2 months of summer. Walking into La Salsa the first thing I remembered was how small the place is, just the size of the front room of a small terrace house. Looking at the drinks menu I was very happy to see that they serve my favourite Spanish beer Estrella on draft! We were off to a good start! The restaurant is an ‘all you can eat’ restaurant but not the usual self-service, buffet style with over-held, cold food. The menu consists of around 40+ tapas dishes which can be ordered 4 at a time (per person) but as many times as you like. We ordered a wide selection of dishes from breads, olives and salads to patatas bravas to mussels, prawns, chicken wings and meatballs. They started to arrive fairly quickly. I was shocked at how tiny the portions were, definitely much smaller than my last visit. I understand that they’re doing it to avoid waste and cut down costs. It doesn’t really put us out as we could reorder as many times as we liked but getting served 2 tiny meatballs or 2 mussels at a time was quite hard work, particularly when we like to share. Needless to say we ordered several more times and between us must have got through most of those 40 dishes. Everything was cooked really well, it’s simple cooking that lets the ingredients speak for themselves which is fine when everything is good quality and cooked well, which it was. One of the standout dishes was the Calamari which was perfectly soft and moist inside with an excellent crispy beer batter and served simply with a slice of lemon and a delicious garlic mayo. 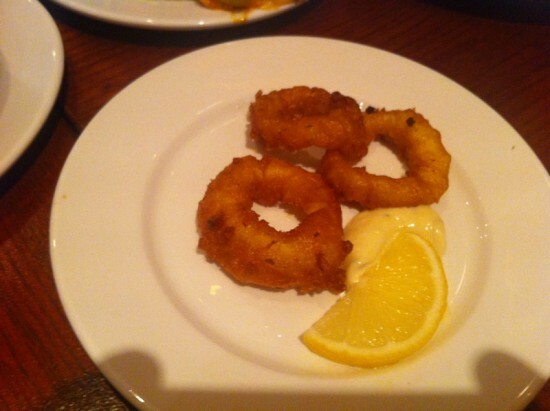 Each portion is only 3 small calamari rings but several were ordered they were so good! Most of the seafood dishes were excellent including battered king prawns, king prawns with chilli, garlic & peppers and 2 different Mussel dishes, one with pasta and one with a gorgeous spicy tomato sauce. Another highlight was the white fish. Which was again a tiny piece of fish and again served very simply with just a few sautéed peppers and onions but the fish was perfectly cooked and delicious. 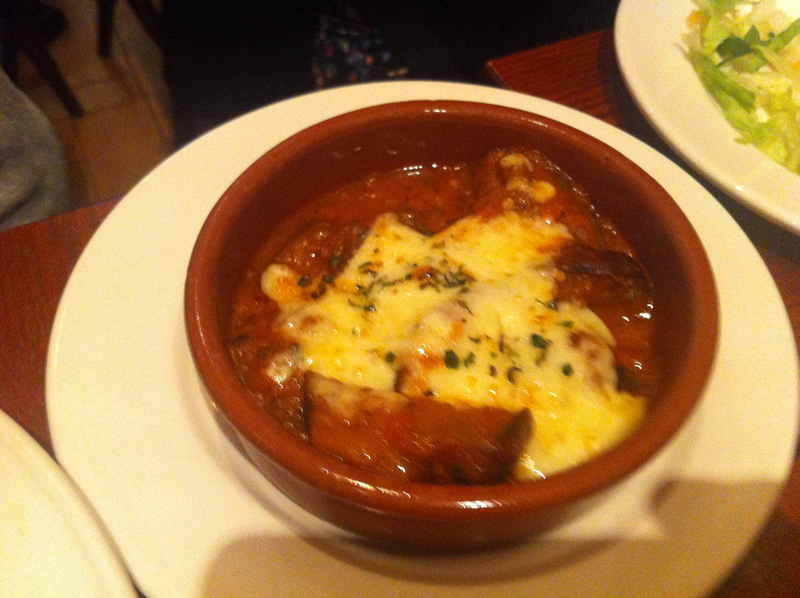 Another favourite was a vegatable dish of roasted aubergine in a rich tomato sauce, topped with cheese. The combination of soft aubergine that had soaked up all the tomato sauce and topped with stringy melted cheese that had been over baked to crisp on top was a joy to eat. Simple and containing only a handful of ingredients but utterly delicious to eat. 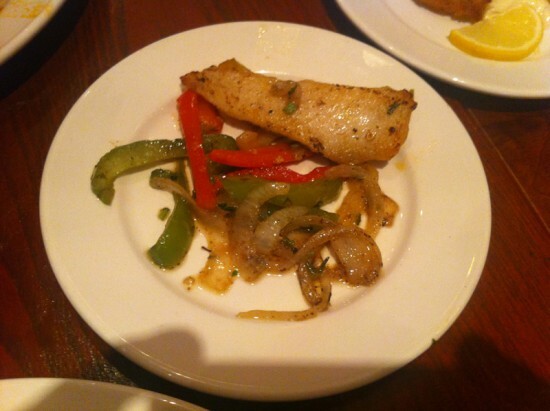 Service was fast and attentive but we did have to reorder several dishes as they kept missing them. Really the only disappointment was the desserts which are incredibly uninspiring, basically just a choice of 3: Tiramisu, Chocolate Cake and Ice-cream. My rule with desserts is that if i’m already full i’ll only have something interesting or exciting. I’d eaten far too much to be forcing myself to eat any of those which was a shame. Overall though it was a good night and it’s certainly exceptional value for money. I can’t think of a place where you can get as much food of this quality for so little. Even the draft beer and house wines are great in both quality and value. We will definitely be back!